Los Angeles Trade-Technical College is the oldest of nine public two-year colleges in the huge Los Angeles Community College District. Nearly half of its students work more than 30 hours a week and all students commute to the college, whose main campus is near downtown LA. For many students, English is a second language. Also, LATTC students, many of whom are pressed for time because they have family and work obligations along with school, commonly spend time sitting in traffic or on the bus during the commute to and from school--excellent time for using an MP3 device. "The problem is time," Delzeit-McIntyre said. "[Students] are working, taking care of kids, taking care of parents. Time is critical." Realizing that, Delzeit-McIntyre first scrounged some used low-end computers discarded when a local county courthouse upgraded. Preparing the free computers was no easy task--Delzeit-McIntyre painstakingly hauled them from a warehouse, a few at a time, in the trunk of her car. Many had bad power supplies, hard drives, or other components; were infected with viruses; or simply didn't work. Of the ones that did, she has now set up some 40 reclaimed computers on campus. The computers are mounted on classroom walls without keyboards or monitors, essentially becoming networked dedicated recording devices. Delzeit-McIntyre has added inexpensive $50 microphones, which instructors bring to class with them. On the software side, she teamed up with Chris Dawson, CEO and president of Box Populi, a Portland, OR-based software startup that offers a simple open source software product that can turn virtually any computer, including very old or low-end ones, into dedicated podcasting appliances. The company's Podcast-in-a-Box software is released under the open source General Public Licensing, or GPL, allowing users to use and redistribute it without fees or limitations. The software requires a computer with a network card containing LAN and Ethernet connections, an audio card, 128 MB of memory, 4 GB of disk space, a 500 MHz or greater processor, and a USB port. That relatively simply list of requirements--some of the initial Pentium computers from years ago can meet it--means that schools on a budget can recycle old computers by turning them into recording devices. "We're giving away, as a software product, something that would cost $10,000 to $20,000," according to Dawson. His rational: Targeting the higher education market dictates open source to reduce costs. That shifts responsibility to schools to find and support older hardware, but he thinks that can pay off for many colleges and universities. Podcast-in-a-Box can be downloaded for free from the Box Populi site onto a CD, then loaded onto each computer to be used for podcasting. To make a recording, a user simply inserts a USB flash memory device into the computer. That action triggers the Podcast-in-a-Box software, and a podcast recording begins automatically, continuing until the device is removed. Via the network, the audio files are sent to a Box Populi server without involvement from LATTC staff or the instructor. Box Populi then publishes an RSS feed (a piece of code that publishes the files onto any Web site automatically). 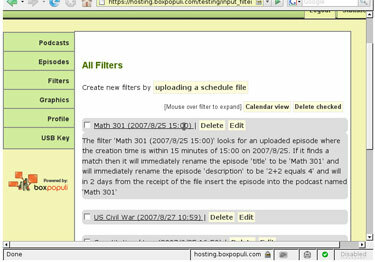 Filters place a podcast episode file into the proper feed in the Box Populi system. The software is set up at LATTC so that when an instructor uses his or her personal USB device at a given time and day, the resulting podcast file is published to the appropriate place. 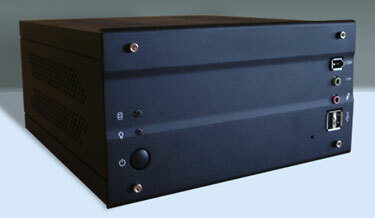 For customers with a bigger budget than LATTC, Box Populi also sells a dedicated podcasting appliance with software loaded and ready to go. A support contract is also available, which includes installation and use support, updates, access to a bug reporting and feature request system, and an MP3 encoder license. "Chris wrote the software for me," Delzeit-McIntyre said. "His parents were educators.... He wanted to take this project and make it affordable for us." Box Populi now has a number of customers in higher education, including several schools in the University of California system, as well as Drexel University and the University of Michigan. For the additional pieces of software she needed, Delzeit-McIntyre is using a free operating system called Wantu, along with Firefox as her browser of choice, and Microsoft's free Audacity software for editing audio files when needed. The school also pays an MP3 licensing fee, as required of anyone who uses MP3 encoding software. Delzeit-McIntyre said she's made the already simple system as easy for instructors to use as possible. She trains faculty by giving a brief overview of the project to groups of instructors, then issues a thumb drive and the needed software key and a microphone. Instructors can simply enter the classroom, plug in the flash drive they've been issued, and begin talking. They remove the flash drive at the end of the session, access the recorded file later via the Internet to add a lecture title and description, then post the recording to LATTC's Moodle course management system. Since the recordings are simply MP3 files, they can be edited by instructors with introductions and endings, if needed, such as copyright statements. From there, any student with Internet access and a password can access the podcasts, either listening to them directly on a computer, or transferring the files to a suitable portable media player, such as an iPod. "I really believe that the listen-to-learn concept needs to be at the root of helping these students," Delzeit-McIntyre said. "When they can listen to a lecture and read a textbook, it can really help."